The ability for an extended gaze beyond the past and present into the future is one of the most important qualities of a visionary strategist and leader. And the emerging trends in strategy and leadership are tending towards highly futuristic approach. An effective strategy must be able to discern the future possibilities and provide a road-map for converting them into profitable business opportunities. This article is an attempt to understand the nature of the possibilities and opportunities lying in the womb of the future, viewed in the modern corporate context. When we examine the evolutionary process of nature, we will find that she marches ahead not only through incremental variations in the same genre, type or species but also by quantum leaps, which create new types or species. This brings us to the question what is the nature of the quantum leap which Nature is contemplating for humanity and earth? This question cannot be dismissed as one of the fads of the new age philosophy because it has practical implications for corporate strategy. “You can’t look at the future as a continuation of the past—-because the future is going to be different. However none of the management thinkers seem to have a clear perception of the nature of the future world. Most of the secular and management thinkers of the west consider the future as something inherently unpredictable. The common idea or belief among management thinkers is that no one can predict the future but can create or shape a future out of emerging opportunities. As Gary Hamel states “The big challenge in creating the future is not predicting the future—-Instead, the goal is to try to imagine a future that is possible¾the future that you can create”. (Hamel .G, 1998) But the eastern spiritual thought believed that there is an intuition in the spiritual consciousness of our soul which can discern the future intention and plan of Nature for humanity or the world or the possibilities which Nature is trying to bring forward or manifest in the future. If this eastern belief is true, then the perceptions of spiritual thinkers on the future can possibly provide a better view of the future possibilities than management thinker. But how to test the validity of this eastern belief or spiritual intuition? It has to be viewed in the context of present trends. If a spiritual intuition helps in a deeper and better understanding of the essence or patterns of the present and emerging tends, then it has atleast a tentative validity. In other words the future evolution will be predominantly in the inner realms of consciousness and not exclusively in the outer material or economic life. The progress which has to be made in the future or in other words the type of progress which is in harmony with the next quantum leap in the evolutionary journey of Nature is the moral, aesthetic, psychological and spiritual development of the individual and the progressive self-expression of this inner progress in the outer life, leading to a corresponding progress of the community. The concept of this higher evolution or progress is not something entirely new. Most of the great civilizations of the past like the Greece, China and India had this ideal and conceived human progress, individual and collective, as a journey towards this ideal. But in the ancient world this ideal was mostly confined to the cultural life of the community, in religion, philosophy, art, literature, and pursued by a few elite individuals or communities. But in the future this higher progress has to be made not only in the religious and cultural life of the community but also in every activity of the secular life like economics, business, commerce, science, technology, family, community. Any approach to strategy which ignores this evolutionary imperative is not likely to be successful in the future. At present corporate world as a whole is becoming increasingly sensitive to ethical issues. As the founder of Infosys, Narayana Moorthy points out: “Investors, customers, employees and vendors have all become discerning and demanding greater transparency and fairness in all dealings”. (Skaria.G, 1999) And the growing interest and emphasis on “Business Ethics” in the academic as well as the professional streams of management augurs well for the future evolution of business. However, for inner progress, the ethical motive has to become intrinsic, which means it has to be pursued for its own sakes, irrespective of external demands or practical considerations. For example, when Pramod Bhasin, President and CEO of Genpact was asked, “how do leaders face up to scenarios, where there could be clash between values and pragmatism, especially in the light of intense competitive pressures” he replied “The choice is easy, if we understand integrity is non-negotiable”. (Bhasin.P, 2004) This answer comes from a mind which has understood the intrinsic need of ethics. However for a more rapid and accelerated ethical and psychological progress of business, the corporate world must arm itself with an inner discipline by which the inner sources of unethical behaviour are eliminated and conversely the inner resources which strengthen the ethical consciousness and will of the individual and the community are augmented. Here comes the importance of Indian Yoga which can be of great help in formulating this inner discipline. This is the inner dimension which will be the most compelling factor of the future. There is also the outer dimension. The trends in the outer life in economics, society, politics, technology and science have been analysed and plotted comprehensively by futurist thinkers like Alvin Toffler and John Nisbet and many others. For example Japanese government has identified microelectronics, bio-technology, material sciences, telecommunication, civil aviation, robotics, machine tools, computer hardware and software as the seven-key-industries or technologies for the first part of the twenty-first century. Similarly most of the futurists have specified emergence of Asia and the growth of Woman-power as some of the mega-trends of the future. Here again, we have to identify the main tasks which will bring out the unmanifest possibilities in the outer life of humanity. We have identified the task in the inner being or consciousness in man as the moral, aesthetic, psychological and spiritual development of the individual and collectivity. In the outer life, the main evolutionary task of the future is to bring out fully all the potentialities of those sections of the society; community or the organization which were either suppressed or not given sufficient opportunities to express themselves. In a nut-shell, the future tends in empowerment is moving towards what is now called as “distributed leadership” which means, initiative and leadership are valued and encourage at every level in the organizational hierarchy. The other more visible trends in the corporate world are corporate social responsibility and environmentalism. The corporate social responsibility is in fact a part of the task of creating equity in society and therefore those companies which make it a part of their corporate strategy and pursue it persistently and sincerely, with a moral commitment to equity and distributive justice will gain evolutionary advantage. The other movement which will dominate the future is environmentalism. Here again many progressive companies are taking environmental sustainability seriously probably because it is also profitable. For example some of the ecological practices like waste recycling, energy conservation and carbon trading save money and resources. However, to achieve evolutionary advantage, the concept and practice of sustainability has to progress from token environmentalism like tree planting to make the entire organizational and industrial process, from procurement to packaging, sustainable. Secondly, the new science of ecology has deep and profound insights on the laws and principles by which Nature sustains and manages her creation. The modern management thinkers and practitioner has to learn from Nature, the science of sustainable management. This is already happening, and when these values get firmly established in the corporate consciousness as the dominant governing motives, it will be a decisive upward shift in the evolution of business. And those companies who are able to make the shift within them will be the leaders of the future world. However as we have indicated earlier, to realize the full moral, spiritual and pragmatic potentialities of these higher values, they have to be pursued for their own sake with a clear understanding of their significance for the higher evolution of the corporate world. For, ethics, spirituality and ecology have a relationship based on correspondence. Just like modern ecology reveals the laws of physical Nature, the ethical and spiritual values discovered by spiritual traditions of the world reveal the laws and ecology of the moral, psychological and spiritual dimensions of Nature. When an individual or a collectivity lives in harmony with the laws of Nature in all the dimensions¾physical, mental, moral and spiritual¾then it is in tune with the rhythms of the creative energies of universal Nature, which in turn is bound to have its positive impact in the inner as well as the outer life of the individual or the community. As this collaborative trend becomes more and more dominant, the concept of competitive advantage, as a deliberate and conscious approach to strategy, will become obsolete; it will be replaced by a networking approach in which the ability to discover and forge complementing partnership with other stakeholders and wherever necessary with competitors, to provide qualitatively superior value or experience to the customer, will be the main factor of organizational effectiveness. This task of managing cultural diversity is an evolutionary task of the future. For Unity-in Diversity is the goal toward which Nature is moving in the collective life of humanity. So every sincere and creative attempt towards creating a free and harmonious diversity without abolishing or suppressing the uniqueness is a task which is in harmony with evolutionary intentions of Nature. Those institutions or groups, which undertake this task, will gain an evolutionary advantage over others. Barret, Christopher, (1999) Interview, ‘Create a Purpose to Engage People’ Business Today, 7th May 61-69. Capra Fritjof and Gunter Pauli (2007) Steering Business Towards Sustainability, Response books, pp.4-5. Hamel, Gary (1998), ‘Reinventing the Basis of Competition,’ Rethinking the Future , ed. Rowan Gibson, Nicolas Bradwan Publishing, London, pp.62-75. Handy, Charles (1998), ‘Finding Sense in Uncertainty,’ Rethinking the Future ed. Rowan Gibson Nicholas Broadway Publishing, London, pp. 17-33. Prahalad.C.K, (2004), The Future of Competition Harvard Business School Press, Boston, 2004, p.110-12. Ray, Michael and Rinzler, Alan, ed The New Paradigm in Business, World Business Academy, Newyork, 35, 148. Robins, Stephen (1997) Organisational Behaviour, Prentice-Hall of India, pp.15-16. Sakaria. G, The Well-governed Corporation, Business Today, November, 1999, pp.25-32. Sri Aurobindo, (1972) Bandematram, Sri Aurobindo Ashram, Puducherry, pp.465. 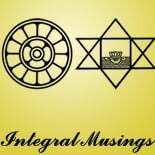 This entry was posted on May 20, 2013 by integralmusings in Integral Management.